First thing I’d do to narrow the field is consider eliminating horses carrying over 11st in the expected conditions. Though classier horses have been more competitive in recent years and we’ve seen some tremendous weight-carrying performances, you only have to look back at the last renewals when the going had heavy in the description. Red Marauder led home just three other horses, two of which had to be remounted and Papillon, a previous winner walked across the line. Critically, he was the only finisher carrying over 10st11lb. It wasn’t too different when Earth Summit led home only five other horses. For most of these animals, this afternoon will represent by far and away their stiffest dates of their racing careers. Expect many tanks to be emptying with a mile to go and hopefully jockeys do the right thing and pull these horses up. I’d then take out 7yo, 12yo and 13yo horses. The last ten renewals have been won by horses within these parameters. And you probably want some chasing experience – at least half a dozen but ideally over ten races under the belt. Then if you only factor in horses that have either winning chase form over 3m on soft going, or have at least placed in marathon distances over 3m 5f in similar conditions then the list starts to narrow significantly to this twelve from the original 40. Tiger Roll, Vieux Lion Rouge, Chase The Spud, The Dutchman, Pleasant Company, Saint Are, I Just Know, Buywise, Houblon Des Obeaux, Milansbar, Final Nudge, Road to Riches. 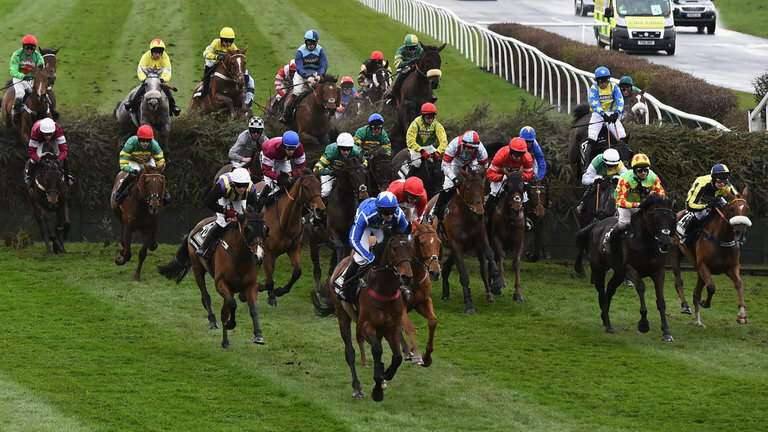 This certainly isn’t the shortlist of twelve I’d be shaking down given typical Grand National going of Good to Soft or even Good and if it dries up considerably in the next few hours I might be left ruing such ruthless elimination of the horses higher in the weights. The lack of recent form against the names of Pleasant Company, Saint Are and Road to Riches is a huge worry though I wouldn’t put anyone off backing Saint Are at the odds available (80/1) and with upto 8 places available (50/1) with 188Sport. He’s got as good a chance as any of getting round. Chase The Spud and Buywise don’t appear particularly well handicapped compared to others in the field and The Dutchman’s last run at Haydock is also a concern having been raised 13lb for a previous romp at the same course. And despite meeting the above criteria, I’m not convinced Vieux Lion Rouge will stay any better than the last two renewals – and he’ll need to. So this is my shortlist of five. Tiger Roll has a master in the saddle in Davey Russell and should go well if he takes to the fences. He has been a bit inconsistent in the past but this horse seems to have a similar profile to last year’s unlucky runner up, Cause of Causes for top trainer Gordon Elliott. I Just Know has been well backed for this race in recent weeks and seems set to run a good race – he’s my one ante-post bet at 66/1. But if you fancy hedging your bets slightly, the three bigger priced selections below will likely stay all day, like the mud and sit conveniently at the bottom end of the handicap. They will probably find one or two too good but should be running on at the end with a clear round.